"It's easier to be a dreamer in Los Angeles," I told my friend Karl as I lamented my lost status as an Angelino. We moved back "home" to the South last year and it brought about the toughest season of our family's lives. One contributing factor was that I had moved to LA to pursue film, and so in moving back with little to show career-wise, I can't help but feel like some sort of failure. It's not entirely true -- as I told a friend recently, every time I had time to work on a movie, I ended up surfing and skateboarding instead -- I guess our habits have a way of revealing what our true passions are. I also discovered that pursuing something as competitive as filmmaking required a great amount of sacrifice, particularly relationally, which was something I guess I wasn't willing to do. Anyway, being away from it all and trying to figure out my life has got me thinking a lot about dreaming. As I said, it's easier to dream in LA, where you're surrounded by like-minded individuals. Here in the South, it's far more common to find a normal, productive, good paying job and just do that the rest of your life. Nothing wrong with that of course -- these folks usually make more money and have far more stable lives than I have ever had. But as I seek out these types of jobs, hoping to find some glimmer of creativity in them, something inside just feels wrong. It's not a good fit for some reason, and over the past couple of weeks I've come to the conclusion that the reason is that I am a dreamer. A hopeless dreamer; hopeless because I can't stop, yet unceasingly hopeful in the pursuits of such dreams. The problem is that people frown on dreamers. We're not in touch with reality. We're irresponsible. On a different planet, we float and drift while we gaze longingly into the horizon, seeking a sunrise, anticipating a sunset, watching for waves or even whales; anything to spark our imagination. Maybe that's why surfing strikes such a chord with me and so many other dreamers I know. And that's where La La Land comes in, the new musical that reminded me that it's okay to be a dreamer. And not just okay, but necessary. The world actually needs dreamers. People like watching others do things they are passionate about. I paraphrase the film there, and it is so true. This life is so filled with passionless moments, drudgery and the grind. When we see someone who is passionate about anything, it injects just a little spark of life into our own existence that we can't help but be drawn to it. Like moths to a lamp, we float around, wondering what could happen if...watching to see if others try...maybe flying away or maybe, just maybe, getting closer. And closer. Until...zap. You're dead. And that's the other thing La La Land taught me: to truly pursue dreams requires sacrifice. It was the same lesson I learned in the real La La Land, the one that brought me back home seven years later. I wasn't ready to make those sacrifices, and so here I am. Kill the Dreamer: Maybe it's time this guy just leaves and never comes back, right? But then I am abandoning a portion of myself that I feel was placed by God. And not just a portion, but the motivator, the spark plug, if you will. Without it, I'm not firing on all cylinders (or firing at all). Try Again: Maybe I gave up too early. Maybe it's time to give it another go and see what happens. This requires a level of planning I was too immature to prepare for, and, again, sacrifice. But this time the stakes are higher -- I have a wife and kids I'm dragging along with me. Is it fair for me to bring them through what it would take to attain the dream? I'm not sure. Dream a New Dream: Dreaming is like a journey. You imagine a future that is more wonderful than your own and set out for the new country. But what happens when you get there? Is that home? Or is there another home just beyond that horizon? Or maybe you take a detour, or a few different turns altogether, and realize home is where you never expected it was. It's all a process, and probably should be, lest we end up like the drummer in Whiplash (by the same director as La La Land). I think I like the third one best. I think this will be a good year. My focus is narrowing as I mature. I'm completing songs and books I've been working on for years. I'm realizing what sparks my heart and embracing it as a part of who I am, who God made me to be. 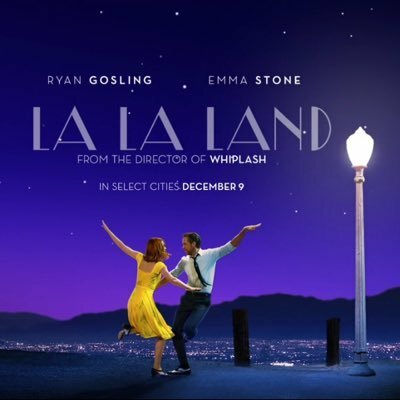 The day after Katie and I saw La La Land, I was driving to work and feeling energized by the story. The city was covered in fog as I drove through downtown. But then, I hit a bridge that lifts high above the Cooper River, and as I rose, the brilliance of the sun broke through the clouds. It felt like I was driving to a cloud city, high in the sky with nothing below me for miles and miles. It also looked like the sun was on a path to collide with the earth, destroying everything we know in a glorious explosion. As my imagination soared, I remembered that there was certainly reality below me -- water, boats, rocks -- and that the sun wasn't going anywhere. But the dream was more fun, so I stayed there a little longer. Two fantasies. Two stories. One mind exploring. Before too long, I inevitably was headed down the bridge, back into the fog. And that's when it hit me -- we all have a choice: to focus on the dream or the reality. Not that dreaming I was driving to a cloud city made it true -- my four wheels were still on the ground -- but the dream made that drive better. It was fun to explore and think and imagine. It's inspiring. And that's what dreams do: make things better. Lately this whole city has been covered in fog.